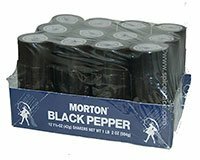 Morton® ground black pepper in disposable shakers. Each shaker contains 1 1/2 oz (42g) of ground black pepper. Pack contains 12 individual shakers. Morton is a registered trademark of Morton International, Chicago, IL USA.